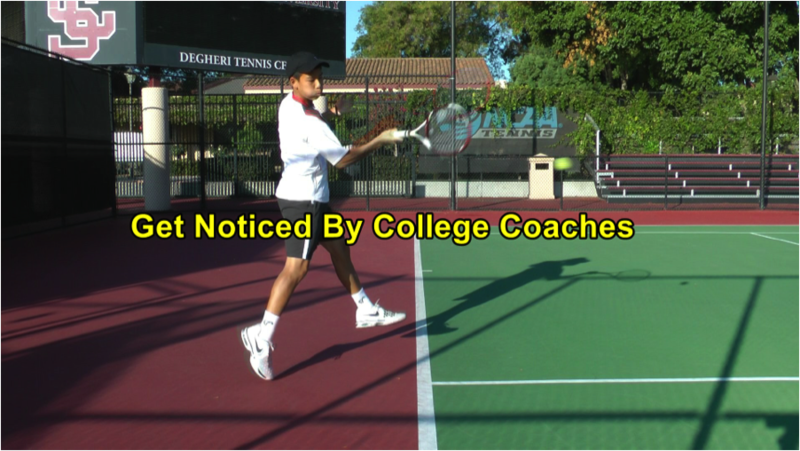 Professional high-quality college recruiting video produced by Multimedia Tennis that can significantly boost your tennis recruiting profile and increase your chances of getting recruited by your favorite college. Whether you would like to get a scholarship on a Division I team or make it onto the roster of a Division III team, it’s important to get noticed by college coaches. One of the best ways of getting on a coach’s radar is by submitting a professional college recruiting video. Our College Recruitment Videos aren’t flashy and overproduced. Rather, they get to the point and don’t waste the coach’s time. We include what the coaches want to see. We make you look good, but keep it realistic, so that the coach gets a good idea of the real player behind the video. Coaches appreciate this, and we have a high success rate of our clients getting recruited to join college teams as a result. College coaches have very limited opportunities to see recruits play in person, and tournament records don’t tell the whole story. This makes video footage of a player’s strokes and point play critical. It is also important to submit video that shows the player in a good, but realistic light. Multimedia Tennis is able to put together college recruiting video packages that contain the information college coaches look for, and we have been successful in helping to get players into the colleges of their choice. We also analyze player’s games by offering Dartfish match tagging and technical stroke analysis. Organizations who have utilized Multimedia Tennis’ Dartfish video analysis include USTA Player Development, USTA Norcal Regional Training Center camps, Eagle Fustar Tennis Academy, and the Mountain View Open. Multimedia Tennis utilizes various forms of media technology to grow the game of tennis, help players of all levels achieve their tennis goals, and capture lasting images of the finer details of the game.